My daughter did this last year and she loved it! It’s just a week of sleep-away camp with emphasis on art, music and/or performing arts. Your child gets to choose what to emphasize. She had the best time, and would love to go back but you are not allowed to go back-to-back years in order to give more kids a chance. Ask your child’s music or art teacher about it if you think it’s a good fit for your child. The other thing: it’s very well priced! All in all, my daughter would say it’s the best sleep away camp ever! The camp is called DARTS. (Days in the Arts). The BSO’s popular overnight summer camp is now open for pre-application. For more than four decades, the BSO has provided thousands of children throughout Massachusetts with an opportunity to participate in this multi-arts/creative writing overnight camp in the beautiful Berkshires. In the summer of 2012, Newton students in grades 5, 6, & 7 are eligible to participate in Week 6, JUL 30 – AUG 3. Only 15 students from Newton will be selected to participate by lottery. 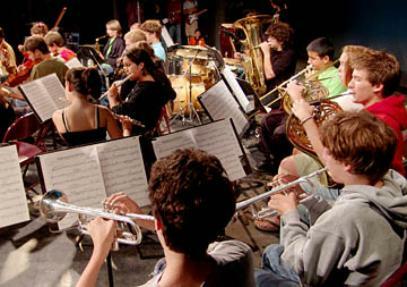 Pre-applications with details about the program are available from the music teacher in your school. Pre-applications must be returned to the Fine Arts Department no later than 4:00PM on Thursday, March 1st, Newton Public Schools, 100 Walnut St., Newton, MA 02460.